KIEV, Ukraine — Volodymyr Zelenskiy has no political experience, but that’s no problem for the people of Ukraine who have already seen that working for him. In a striking example of fiction morphing into reality, the 41-year-old comedian and actor seems set to take the top office for real, following in the footsteps of the man he plays in a wildly popular television series — an ordinary teacher who becomes an unlikely president and succeeds in bringing the country together. “This is only the first step toward a great victory,” Zelenskiy said after the vote. His easygoing manner and snappy talk on the campaign trail strongly resembled his character in “Servant of the People” — a schoolteacher catapulted into the presidential seat after a student’s video of him blasting official corruption goes viral. Inmates hired by his enemies try to kill him, but he survives and gets out, to find Ukraine broken into multiple fiefdoms and sunken deeper in poverty. He regains the presidential post and leads the country to peace, prosperity, integration into Europe and reunification. Ukraine has suffered from economic meltdown, endemic corruption and a spiraling conflict with Russia-backed separatists in eastern Ukraine that has killed 13,000 people since 2014. Its hopes for integration into the European Union and NATO remain as elusive as ever, and there is no realistic way for Ukraine to reclaim control over the Crimean Peninsula that Russia annexed in 2014 in a move that most of the world sees as illegal. For those who cast ballots for Zelenskiy, his lack of political skills is a major advantage, a welcome break from the cast of familiar political figures associated with the country’s woes. Born to a professorial family in the industrial city of Kryvyi Rih when Ukraine still was part of the Soviet Union, Zelenskiy is a native Russian speaker, something that helped him sweep the vote in central, eastern and southern regions where many speak Russian. Pressed on political and economic issues on campaign trail, Zelenskiy usually avoids excessive details, promising to rely on a team of professionals. 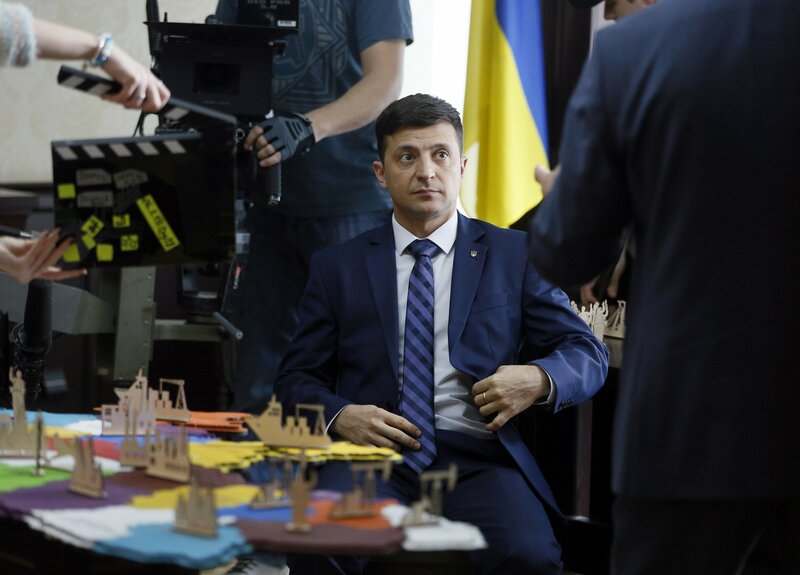 Zelenskiy rejects Poroshenko’s claim that his lack of experience will make him unable to stand up to Russia, pledging to firmly defend Ukraine’s interests. He charged late Sunday that he will make sure that Russia not only returns the occupied territory back to Ukraine but pays compensation for the “disgusting and horrible” land grab. Poroshenko has sought to disparage Zelenskiy, accusing him of being a “puppet” of self-exiled billionaire businessman Ihor Kolomoyskyi, whose station airs “Servant of the People.” Zelenskiy, who has bitingly mocked the president in his stand-up performances, shot back by ridiculing Poroshenko and his associates accused of corruption.